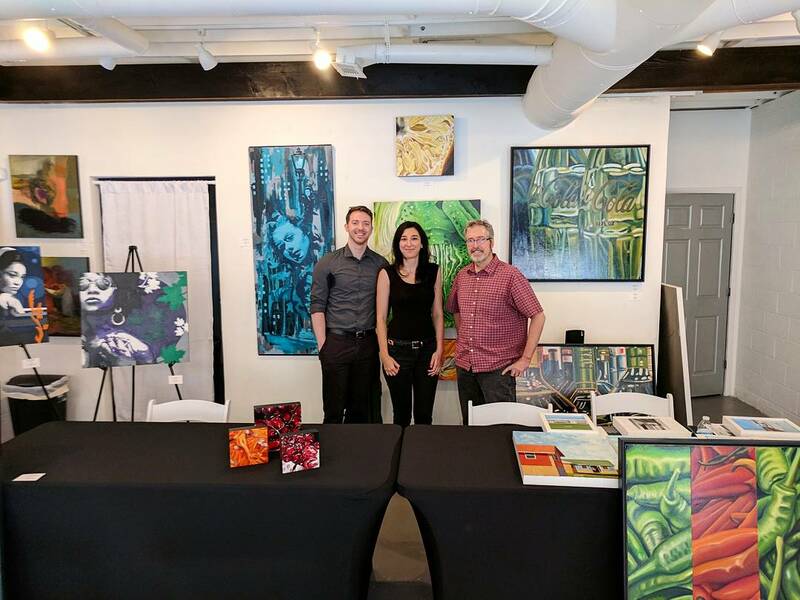 The artists James Gilbert, Angela Faustina, and Craig Ford featured at the BRANDED artist talk at gallery43, Roswell, Georgia, 2017. Fellow gallery43 artists James Gilbert and Craig Ford joined me in the discussion to celebrate the BRANDED group art exhibition opening. We are all painters but have vastly different approaches to art, inspiration, and subject matter. It was fun to compare and contrast our stories, discover similarities, and find inspiration in the other artists’s techniques. 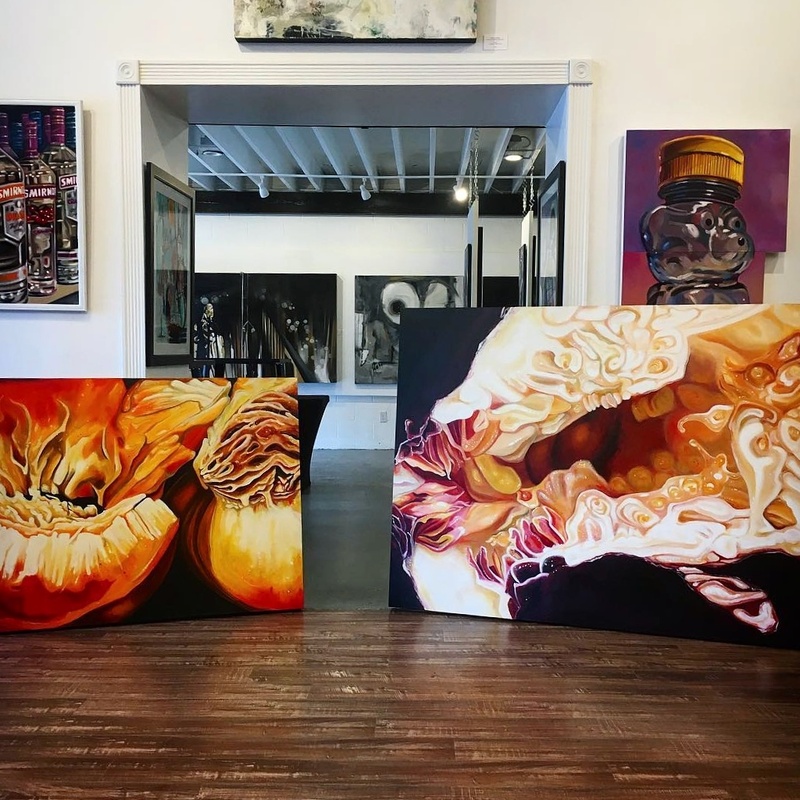 Angela Faustina’s oil paintings Peach I and Black Mission Fig I before installation in the BRANDED art show in gallery43, Roswell, Georgia. For purchasing information, please contact gallery43. After introducing our work and ourselves, we started talking about branding. 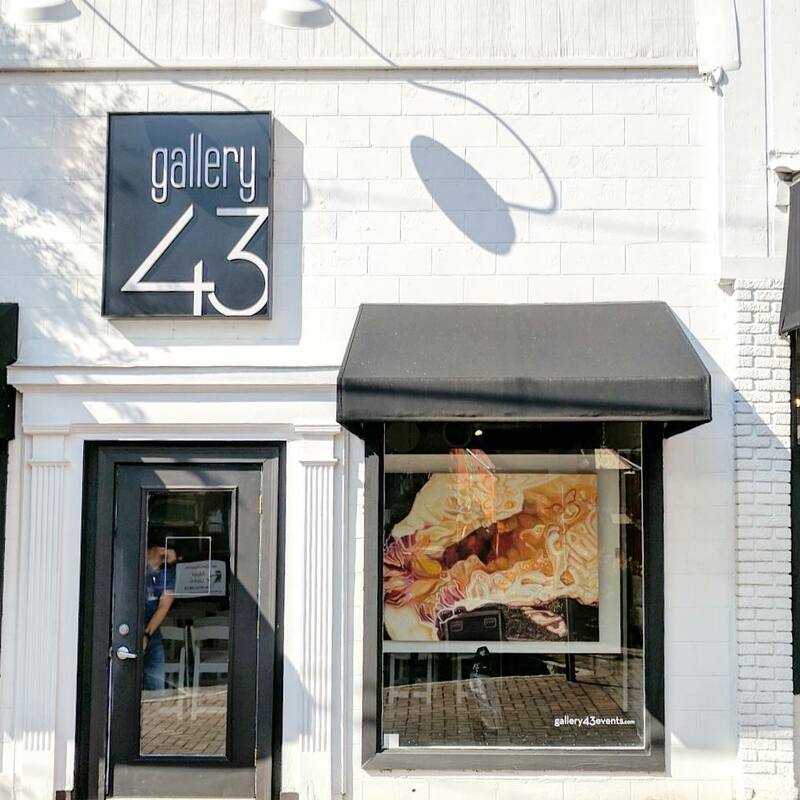 gallery43 owner Bonnie Buckner Reavis said that I have instantly recognizable work; how does that help and maybe even hurts or limits your sales? My work can be pretty weird so it’s not for everybody. I think the consistency in my work and my reputation have helped shift this mindset but even up to a few years ago, I’d constantly get asked why I don’t do something else, something less weird and more recognizable. Some people just aren’t familiar with my subject matter, too. I can’t tell you how many pictures of salads or dinner plates or juice bars I’ve had sent to me that prominently shows a fig or pomegranate and the person will be like, “I finally get your paintings now!! !” A couple of people have had very strong, very negative reactions to my work and others – friends, other artists, galleries, the public – will instantly dismiss it. But that’s art! I appreciate when people have those gut reactions because I do, too. 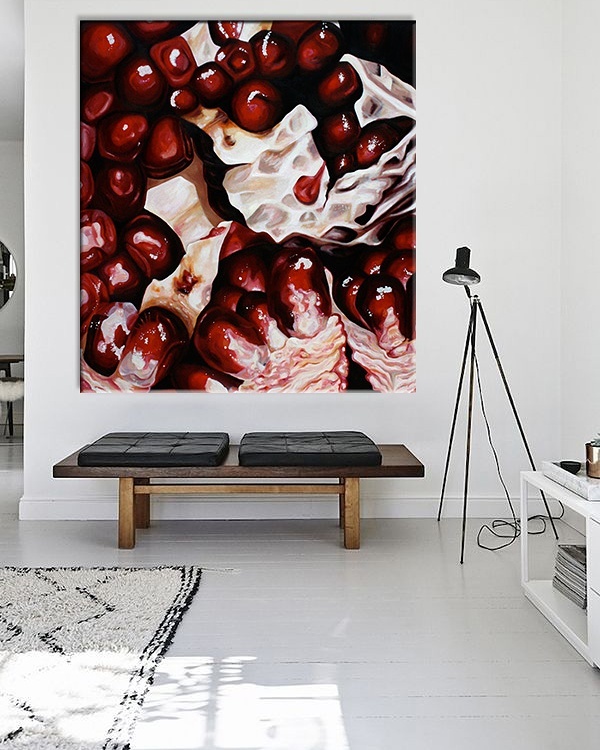 Angela Faustina’s oil painting Pomegranate X hanging in situ in a modern living room. For purchasing information, please contact gallery43. They can also swing the opposite way, though. A gallerist was once hanging a three person show I was in in Italy a couple days before the exhibition opening. She heard knocking on the windows and it was a couple who wanted to buy the large pomegranate painting she was hanging up. The gallerist said that was the first time that had ever happened to her – and that was obviously the first time it ever happened to me! The couple were taking a walk through the city, saw the painting, knew exactly what it was and fell instantly in love with it. 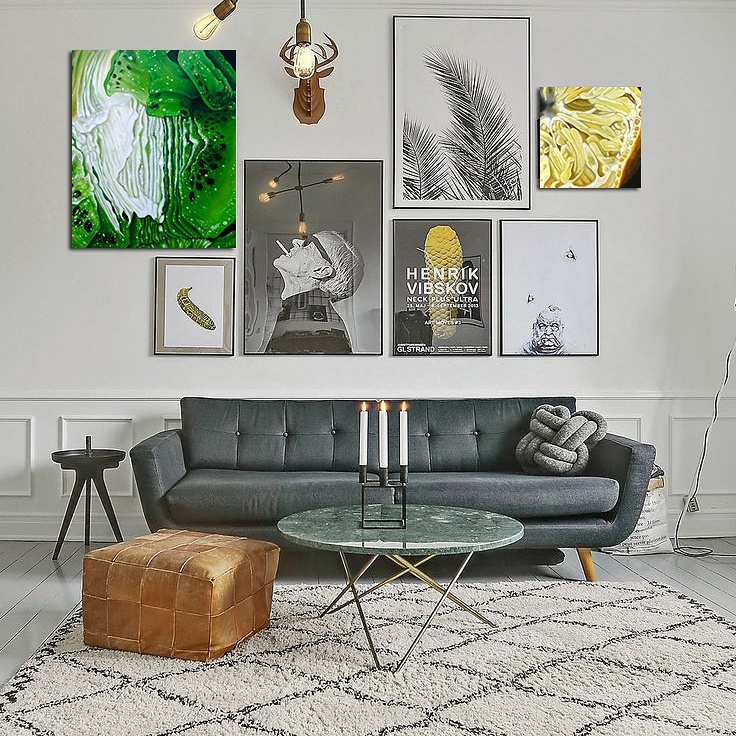 Angela Faustina’s oil paintings Kiwi I and Lemon I hanging in situ on a gallery wall in a contemporary living room. For purchasing information, please contact gallery43. I have to thank gallery43 again for putting together such a fun event and letting me be part of the discussion. Speaking with other artists and art lovers is always a pleasure! My studio practice is pretty quiet and solitary so it was wonderful to be part of a literal conversation about local contemporary art. I’m grateful for their support and extremely happy to be a gallery43 artist. 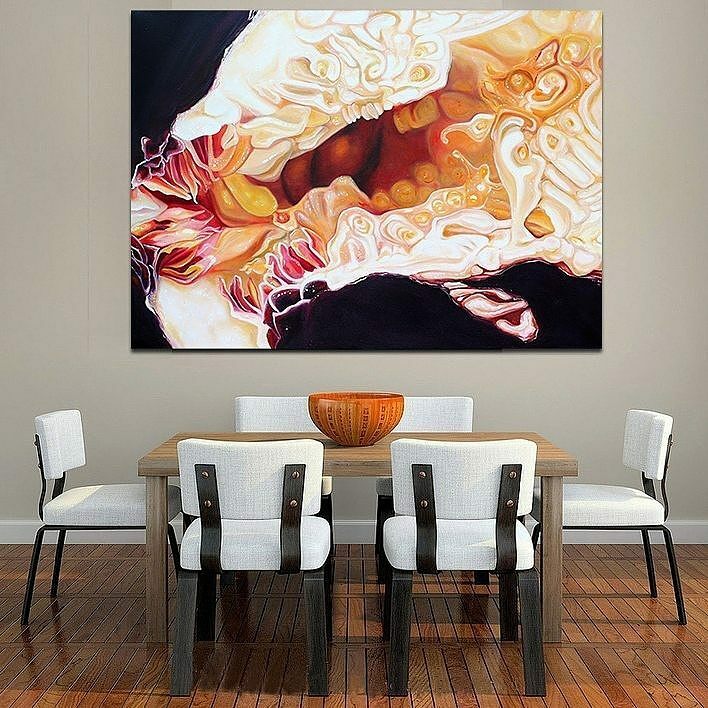 Angela Faustina’s oil painting Black Mission Fig I hanging in situ above a dinner table. For purchasing information, please contact gallery43.